The Austin area has, for the 5th year running, been among America’s two fastest-growing major metro areas by population. Although everybody knows about the new apartments sprouting along transportation corridors like South Lamar and Burnet, much of the growth has been in our suburbs, and in suburban-style areas of the city. Our city is growing out more than up. How come? The desire for living in central Austin has never been higher. But Austin, like most cities, has rules that prevent new housing from getting centrally built. That makes it easier to buy and build on virgin land in the suburbs. Here are some of those rules. Historically, expensive houses were built on expensive, large lots; cheaper homes were built on smaller, cheaper lots. Austin decided that new houses can’t be built on small lots. Even if you want to build a small, cheap house, you still need a lot with at least 5,750 square feet. In central Austin, that costs a lot of money, even without the house! If somebody owns a 10,000 square foot lot, they aren’t allowed to split it into two 5,000 square foot lots and build two medium-sized houses, let alone three 3,333 square foot lots with three small houses, let alone three 3,333 square foot lots with triplexes! Outside the central business district downtown, there are limits on building heights. These limits vary based on zoning category, but except in a few special districts do not exceed 60 feet. Most residential lots in the city have height limits of 35 feet. Austin’s most defining architectural genre: the car storage facility. Outside downtown, all housing must build parking—whether surface parking, carports, or garages. These parking spaces cost money and count toward impervious cover limits. If they are enclosed, they count toward floor-to-area ratio limits. Single-family zoning and multi-family zoning are different categories with different limits on the variables above. However, if a multi-family zoned property is located next to a single-family house, additional rules limit these variables in the part of the lot close to the house, including height limits and setback requirements. There are very few properties in central Austin that aren’t next to single-family homes. Whether building single-family houses or apartments, one must comply with all the technical rules of development. For apartments, there’s an additional layer of requirements, such as the creation of site plans with detailed engineering drawings subject to staff review. Single-family houses aren’t required to prepare site plans. Getting site plan approval can add a huge expense to apartment development–an expense unbearable for smaller, 3–4 unit projects. I say would not, because Austin has almost completely regulated 3-4 unit buildings out of existence. In 2015, there were only 76 permits for new 3-4 unit buildings, compared to 11,574 new single-family homes. In many ways, Austin is headed in the wrong direction. The city is getting more expensive, more sprawled-out, and less environmentally sustainable. This results from the difficulty of building centrally. The more the city’s population grows, the harder it is for people to find affordable homes with convenient, environmentally-friendly commutes. Many people are finding themselves not drawn to the suburbs, but pushed to the suburbs—car-dependent and stuck in traffic by economic necessity. Each of our rules were put into place for a reason. Limits on impervious cover regulate stormwater drainage to prevent flooding. Front setbacks can make sidewalks feel wider. Minimum parking rules discourage residents from competing for on-street parking. But when combining the whole package, the result is that it’s extremely difficult to do the one thing we absolutely have to do for environmental sustainability: build housing with short commutes. Instead of getting the sum of the benefits of these rules, we are getting the sum of the costs, leading to environmental destruction, economic hardship, and architectural conformity. And that’s just in the short-term! Long-term, the results could be far worse. Austin needs more central-city housing. That doesn’t mean that every one of these rules need to be removed, but we need to understand why developers are making the choices they are. I love it! What central planning says they want is being thwarted by their own rules. The result, massive cronyism. You’ve actually taken the time to prove why the regulations, not evil developers, are the problem. Don’t you think blaming regulation is missing the mark a little bit? Those regulations are typically the result of demands from the market…property owners use those regulations to defend/preserve what they think brings value to their neighborhoods. The exclusionary elements of these regulations cannot be ignored (practices like redlining incentivized a good portion of some of these regulations to ensure that multi-family units didn’t infiltrate single family neighborhoods since MF essentially meant renters that could possibly be among the group of “those people”). It seems a little unfair to blame planners for succumbing to the demands of property owners and the institutional forces that finance the construction of cities and neighborhoods. It’s also worth mentioning that it’s easy in hindsight to see how bad the cumulative results these regulations have had on the health of neighborhoods and cities, but many people at the time thought they were doing the right thing by enacting these codes. That’s an anachronistic judgment that none of us are in a position to make. It’s one of those death by a thousand cuts scenarios. I don’t quite see how it’s cronyism either, most planners I know are the first people shouting to change these sorts of regulations. Many planners would have had these regulations revised/adapted/removed yesterday, but pressures placed on municipal officials by property owners and NIMBYs make it very tough to enact widespread changes to LDRs. The dynamics of property ownership play a huge role in this…at what point does a property owner’s expectations for the type of neighborhood they feel like they invested in sunset? People are resistant to change, and in many cases that resistance has been justified, so when a planner proposes changes to the land development regulations or future land use, many property owners see it as an affront to the single family detached neighborhood that they bought into. There’s merit to both sides of the aisle. Neighborhoods need to have the flexibility to evolve over time, but that could invite change that many property owners don’t feel comfortable with, nor expected when they purchased their property. It’s not a simple issue. I don’t think it’s cronyism and or regulations that are the crux of the issue and this isn’t even getting into the realm of developers…not all developers are bad, but some aren’t very good either. Rather than manage the massive uphill battle of dealing with the NIMBYism of adjacent property owners in the central city, many chose/choose to develop on the edge of towns and work to either amend the existing regulations to fit their needs (let us not forget that a planner could have lobbied to change the code of comp plan policy for a long time to little effect, but a politically powerful developer can come into town and get all the amendments they need to move forward with a project in a fairly short amount of time), get a variance, or submit the development as a Planned Unit Development to circumvent any existing land development restrictions. That type of development has had long term costs economically, environmentally, and socially for local governments/communities. We are at a point where we can no longer ignore the issues that have produced few results in the realm of redevelopment and infill development. We simply can’t afford to continue developing at the edge. Hopefully, article’s like this can advance the discourse and deal with some of the underlying issues that are fundamental to many of the regulations that are impediments to the type of development we advocate for. Actually regulations are typically the result of one of two very vocal people making complaints, not necessarily the whole market. Don’t forget NIMBY and neighborhood control – especially in the central core of Austin. Austin’s Land Development Code and virtually all of the regulations mentioned are the product of central neighborhoods who are complaining: “Downtown is blocking my view of downtown.” Wake up Central Austin neighborhoods – you live in a real City. They’re trying to make a point that a minimum lot size is a bad idea… But obviously if you’re going to have a house then you want to yard….so chopping a 10,000 sf lot up into 3 lots that are all 3,000 square feet is a horrible idea because you would then have no yard…and with pressure from development and the lot value all of the lots in Austin would be subdivided into 3,000 sf lots….and then you would end up with a city of yardless houses….. And if you had no yard you might as well live in multifamily family …..aka a condo….because that’s a much more efficient use of the lots as parking is incorporated, there are amenities, and you can go straight up like the downtown condos do…. not to mention that condos and multi-family are 3x more efficient to build and three times more energy efficient. In conclusion…. the person that wrote this has no clue about urban planning principals like the brilliant minds that implemented the zoning principals in Austin in 1999 as they do not understand that the answer the equation is that a city grows vertically as downtown Austin is….on the lots that are zoned for multifamily. This solves all of the complaints that the writer has mentioned and allows the lots that are 6,000-10,000 sf to keep the yard vs having 3 houses on a 10,000 sf lot which would mean that there would be no yard and each of the 3 houses would have a small unusable space between each on the 3 homes…..Good Luck Houston….I think we have a problem…..
Not everyone NEEDS a 7000 sf yard to be happy. Give me a 3000 sf lot and I will give you a house with a perfectly fantastic yard. Point being, it should be up to the landowner to decide if they have a 10,000 sf lot to build one large 4,000 sf home with over 6,000 sf of land leftover, or three 1,300 sf homes with over 2,000 sf of yard. As it currently stands, there is no option and you are essentially forced to build a not-so-affordable 4,000 sf house, rent, or move. Hence, the ‘missing middle’ that would help contribute to a lacking diversity in Austin. They are designed to prevent Developers from take advantage of a hot market and building a 10,000 square foot home on a 10,000 square foot lot…. Just to make money and flipped the property… In the end the developers take advantage of the city and the city loses every time. This is day one stuff and Urban Design and Development…. This has happened in markets such as San Francisco and New York 30 to 40 years ago. Greedy Developers that took advantage of the system to make money forced regulations and floor to area ratios in all major American cities that have thoughtful urban planning and have planners with foresight that are looking out for the future of the city. That is one (glass is half empty) way of looking at it. Another is that developers perform based on market needs. The current planning and zoning regulations are designed for anyone, whether custom or spec, wanting to do a 2300 sf or more house, which makes our current zoning exclusionary. Since not everyone needs a +2300 sf house or do not want to live in a 600 sf condo, there are little to no in-between options in Austin like other cities, and hence our ‘missing middle’ housing. If properties within the urban core are either rezoned or the zoning regulations allow for it, we can have more affordable housing and density. I am not advocating to get rid of your large mcmansion housing that you may love, but advocating for homeowner and developer options, i.e. 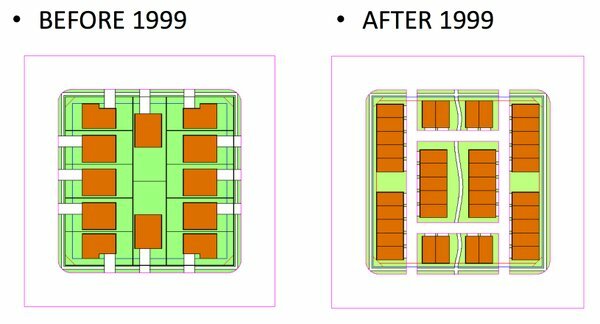 per our previous example, with your lot, you can either have three medium size 1300 sf houses or one large 4000 sf house.